I’ve always loved wheat beers and more specifically Belgian Whites. Hoegaarden and Franziskaner are top of the list. Give me a beer that goes down like steak and potatoes. Yes, please. When it arrived, it turns out it was shipped by Adventures in Homebrewing in Ann Arbor, MI. Huh. So that’s why their websites look exactly the same. I thought it was just a homebrew store WordPress template or something. I have had medicinal/iodine/band-aids off-flavors in all of my beers up to this point. After much research and pulling my hair out, I found this is common when brewing with city water. I have a Brita Filter pitcher and use only filtered water in my brews. I have always been meticulous about using filtered water throughout the whole process. It isn’t quick to filter over five gallons of water with a single pitcher, so I was less than pleased to find the chlorine/chloramine from the city water was making it through the filter. So, campden tablets it is. I ordered a 100 tablet pack from Amazon in preparation for my next brew day. When I bottled this beer, the fermenter bucket had an overwhelming smell of clove. I was worried it was going to be undrinkable. Instead, there is barely a hint of clove or cinnamon. Barely a hint of orange. It was boiled in for ten minutes! All I taste is band-aids. After that, it’s OK. Just… meh. 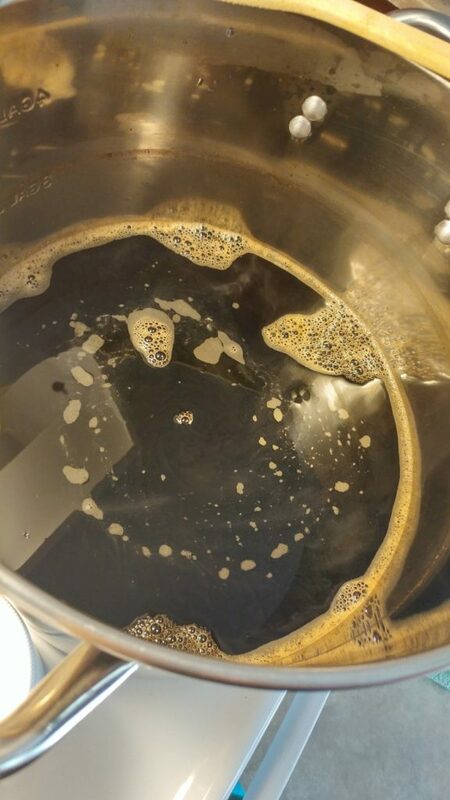 In brewing this Oatmeal Stout recipe kit, I noticed first that the water turned immediately black when I dropped the grain bag. Second, I noticed the water wasn’t deep enough to soak all the grains. I had to keep smooshing it down. After a day or two, the airlock wasn’t bubbling anymore. I was worried the batch was ruined. I pushed the airlock in tighter and the next day it was bubbling again, so disaster averted. I washed up and sanitized all of my bottles and bottling accessories. Along with cleaning up the kitchen, the whole process ends up taking hours. I’ve always got some music or a podcast going. 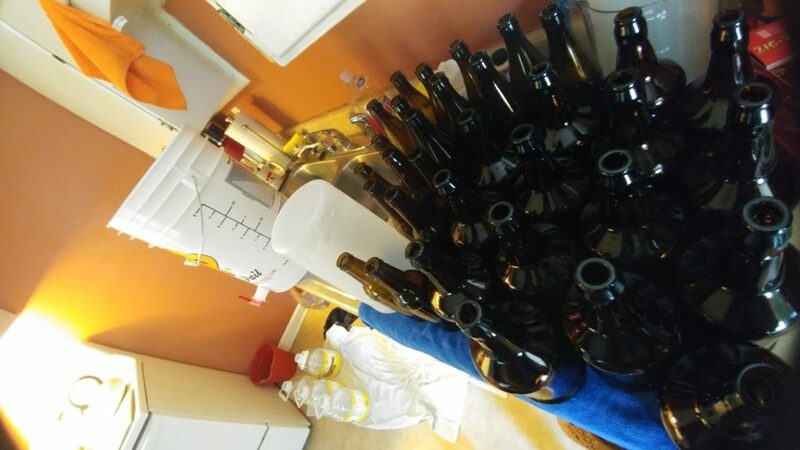 This bottling day was accompanied by Master of Puppets. 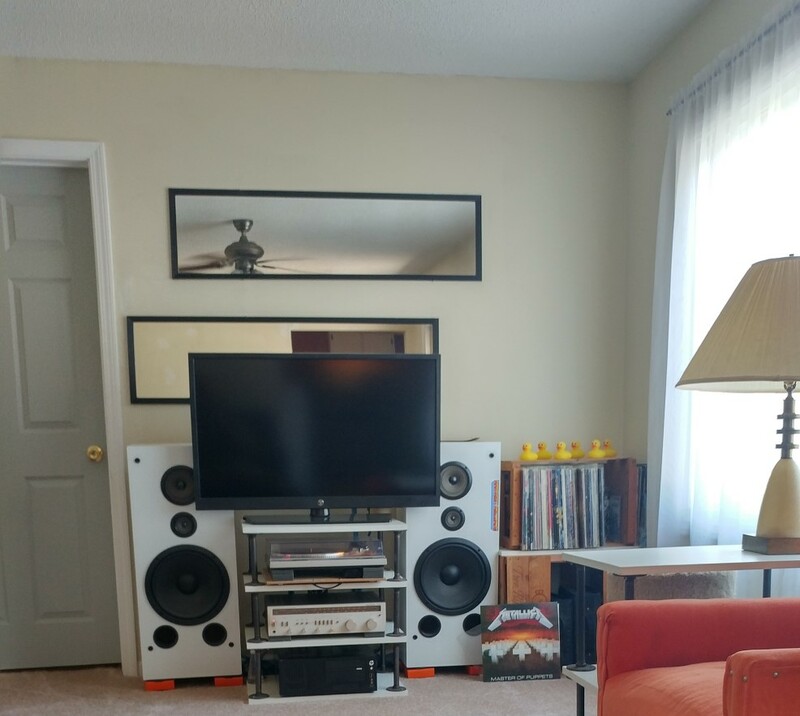 No, YOU have rubber ducks on your records. The fermenter bucket smelled so heavily of cloves that I’m worried the beer is going to be undrinkable. I had ordered a 7 inch hop bag with the Oatmeal Stout recipe with intention of using it like a sock on the end of the racking cane. Unfortunately, it turned out to be a loose weave material like the grain bag they ship with these recipe kits. I was expecting a nylon bag. 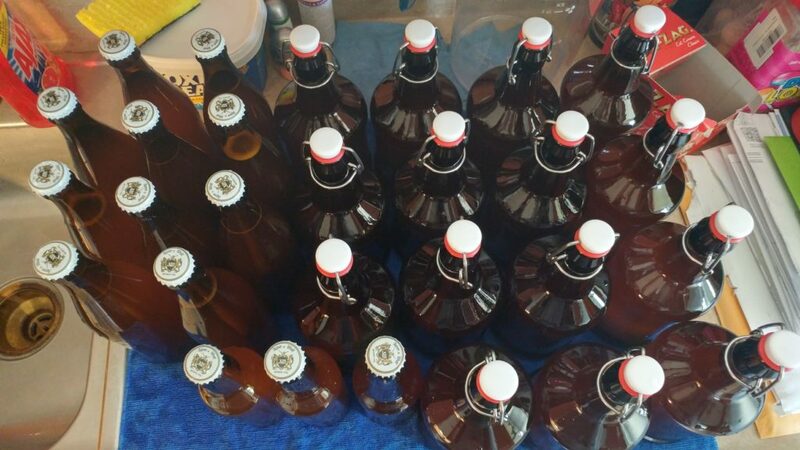 I wrapped the hop bag in a couple of layers around the business end of the racking cane and started siphoning into the bottling bucket. I soon found it was heavily aerating the beer, which you don’t want to do at this stage. It looked like one of those chaser led light tubes, so I removed it after a little while. These are a mix of the 25oz barbecue sauce flip-top bottles I ordered from Adventures in Homebrewing at the same time I ordered my brewing kit, and some 16.9, 12, and one 11.2oz bottle I label-peeled. After moving into this house and realizing things like pots and pans didn’t fit in the kitchen cabinets, I bought and assembled a four door flat pack cabinet. 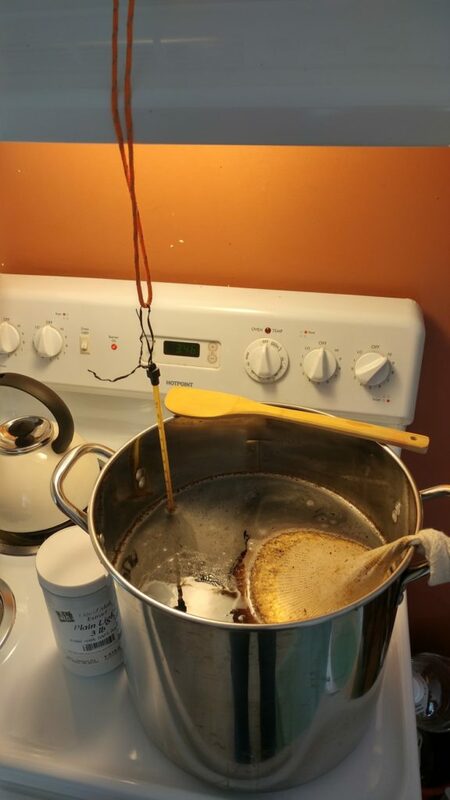 After I started homebrewing, the pots and pans were eventually overtaken by bottles and brewing equipment. After work, I “brewed” the apple jack, loosely following the recipe I found on WikiHow. I heated one gallon of apple juice up to 110° and then slowly stirred in five pounds of raw cane (“light brown”) sugar. I cooled it all down in the sink in an ice bath, then added that and four and a half gallons of apple juice to the fermenter for an even five gallons. I pitched the S-04 yeast and took the whole thing down to the basement. The recipe says it will ferment for six to ten days, but mine was active for nearly a month. Multiple times a day, I was dropping frozen water bottles in the water filled tote to keep it cool. The gas coming out of the insanely bubbling airlock smells delicious. Like sour apple candy. For the apple jack, I ordered a pack of Safale S-04 yeast from Amazon, because I have it on good authority that it makes the best cider. I also picked up five gallons of apple juice at the grocery store, along with five pounds of raw cane sugar. I found an apple jack recipe on WikiHow that I am going to loosely follow. 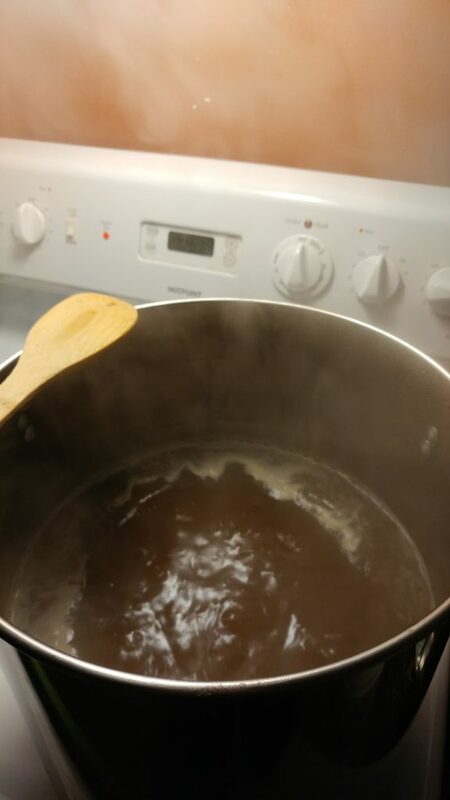 I ordered an Oatmeal Stout recipe from Adventures in Homebrewing with Safale S-04 yeast. I’ve always liked Highland Brewing’s Oatmeal Porter, so I thought I’d give it a go. Also, as an inspiration, Dan just brewed a stout recipe. His plan was to add a homemade cold press coffee to it in secondary. That turned out pretty good, BTW. Holy moly. This beer is explosive. Apparently, I didn’t get my 80/20 priming sugar measurement correct, because this batch is so much more carbonated than the first gallon of Backyard Pilsner. It’s like champagne. 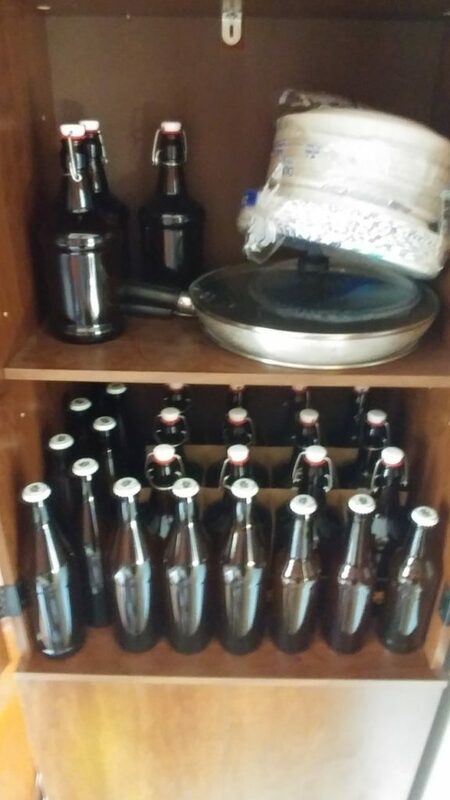 After a couple of days, I ended up moving the whole batch into the refrigerator to stop any further carbonation. I was worried about bottle bombs. The smell is like a basket of fresh strawberries. The immediate taste, to me, is grapefruit. Very sour. Very citrus. The after taste is the old familiar iodine, band-aids flavor that I got with the first, unmolested batch. Your beer is good. It’s very fizzy, but that’s fine. The strawberry is very present, but not too much. I had April try it and she said it’s “citrusy”. If I didn’t know it was strawberry, I might not have guessed too? There is a strawberry after taste that sneaks up on you. It has been a very wet summer and there are gnats everywhere. Even at work in the overly temperature controlled and twice weekly cleaned office. I sacrificed one of these beers (because it’s kind of yucky) with a drop of dish washing liquid as a gnat trap. By the end of the next day, there was a layer of dead gnats in the bottom of the glass. Adventures in Homebrewing had a free shipping sale going on, so Dan and I went in together and bought two more fermenting buckets. It’s a long wait from fermenting to bottling to enjoying. The rare optimistic outlook that I will in the future be able to enjoy them. Thus far, not much success. My plan is to do a batch of apple jack, which has to live in the fermenter for a month or more. Also, in the future, it would be nice to have a couple of batches going at a time at different stages. 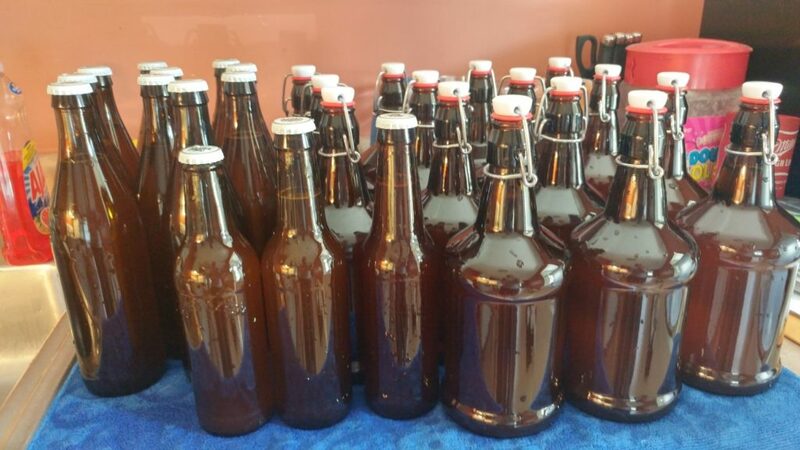 Dan had previously brewed this Brewer’s Best Summer Ale recipe with great and easy success. As with my previous batch, my intent was to do something interesting with the recipe. I set aside the bag of dried lemon and orange peel that came with the recipe kit. Instead, I bought three big naval oranges, cloves, and cinnamon. I zested all three oranges into a big wet, oily pile, mixed in ten cloves, and covered it all in ground cinnamon. I left this in the refrigerator overnight, wrapped in plastic. I got the idea from a recipe I found online for homemade Constant Comment tea. A fall ale seemed more appropriate for this time of year. I added the orange, clove, and cinnamon into the last ten minutes of the boil. Before transferring over to the fermenter, I strained out all of the cloves and orange zest. Brew day went off without a hitch.